As people, we’ve always had a complex relationship with destruction. It’s easier to destroy than to create, but what’s often overlooked is that destruction is often the more satisfying of the two as well. Human history is written in blood and accompanied by a soundtrack of battle cries, gunshots and explosions. The only problem with this is that after thousands of years of practice, we’ve gotten way too good at it. While before we were content with razing armies or small towns, now we possess the ability to destroy entire cities or even nations with the push of a button. We’ve created enough weapons to eliminate all life on planet Earth numerous times over. We’ve mastered the art of annihilation and we’re itching to give the world a demonstration. Warren Ellis and Jon Davis-Hunt’s THE WILD STORM has much to say about our skill at destruction, and this week’s issue #10 reads like, if not a march to the gallows for the human race, at least a painful reckoning. Cole, Kenesha, John, Adri and Angela plot to covertly infiltrate IO’s Hightower. Henry Bendix is ready to move from monitoring IO’s agents to taking some of them out. IO’s analysis team is gaming scenarios of how they can hack into Skywatch undetected. And the appearance of the Mayor sure really seemed to shake up Priscilla Kitaen. War may not have arrived just yet, but you can sure smell it in the air. If Jenny Sparks really is a defense mechanism for the world, it’s little wonder she’s suddenly moved to the forefront of the story. It sounds like the world is going to need her. It certainly will if more people start following Kenesha’s lead. Look, I’m not going to say I know what exactly what was going on with her and her obsession with all things “explody” at the start of issue #10. But I did find it fitting that the first plan the wild CAT landed on was blowing IO up. Their options may be limited, but as they all make clear, destroying IO is a bad idea for many reasons. And yet, they never really let the idea go. Kenesha keeps going on about how awesome the explosion is going to be and Cole ultimately agrees that a small bomb will likely need to be part of the plan. Even if we realize that destroying something is ultimately a bad idea, there’s still a part of us that will always want to go through with it. Bendix, on the other hand, at least has a reason for striking IO. They did violate their treaty and steal technology from Skywatch, after all. At least in his case, an attack wouldn’t be unprovoked. The notion of Skywatch mounting an assault on IO—and by extension, Earth—is downright terrifying. Fortunately, Lauren Pennington seems to be a cooler head that the more impassioned Bendix seems pretty willing to entertain. Of course, the drugs probably don’t hurt either. I’m not sure what’s in that syringe that Lauren injects Bendix with near the end of their scene, but it sure seems to change Weatherman’s mood in quite a hurry. This is the first we’ve seen of Bendix’s dependence on pharmaceuticals, and it gives us some interesting ideas to consider. Ultimately, it’s the drug that distracts him from his irritation at IO and desire for reciprocity. As he says, it allows him to conduct the management of outer space “nicely.” We know nothing about this drug at this point. For all we know, it’s harmless. But drugs rarely are. They often destroy lives, and the irony that one tool of destruction is the only thing keeping a far worse wave of annihilation at bay definitely isn’t lost on me. I’ve said before that I don’t know where The Wild Storm is going any more than you do. I have no clue what’s ahead. But if I had to speculate, my guess is that we’ll manage to stave off war and annihilation for a while longer. For starters, Ellis really seems to be patient and deliberate with his pacing. This series never feels like it’s rushing towards something. Also, as we saw in this issue, there are always going to be voices of reason talking our more extreme minds off the ledge. But I do think we’ll get there eventually. Between the clear escalation of tension between the organizations and the warning signs like Jenny Sparks and the Mayor, it’s clear we’re building to something. 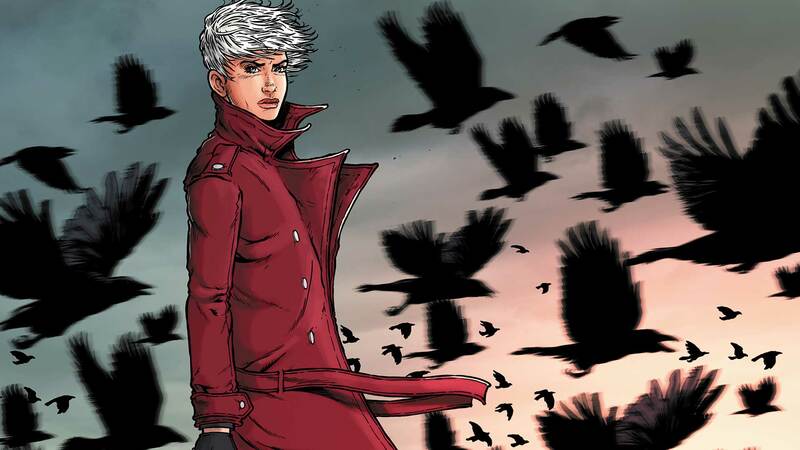 One of the great things about The Wild Storm is that while we may have characters we like more than others, there are no clear heroes and villains in this story. Everyone has their good and bad qualities. When war does come, it may be hard to choose a side and victory for either organization (or for any of the outside forces, like Jenny) isn’t guaranteed. And that’s the problem. When everybody’s flirting with annihilation, you never know who she’s ultimately going to come calling for. THE WILD STORM #10 by Warren Ellis, Jon Davis-Hunt and Steve Buccellato is now available in print and as a digital download. Need to catch up? THE WILD STORM VOL. 1 is in stores now!